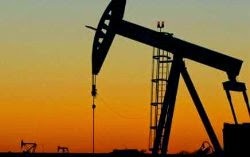 Iraqi Prime Minister Haidar al-Abadi told reporters in London on Thursday that the falling oil prices were imperiling the Iraqi government’s efforts to fight the Islamic State. Abadi made the comments after meeting with the representatives of 20 countries who were gathered in the UK to unify international community’s response to ISIL. Baghdad generates around 85 percent of its hard-currency revenues through oil sales. Oil has lost more than half its value since last summer. The reference to a program to stand with Iraq probably signifies the readiness of the coalition to provide higher levels of financial aid to Baghdad to overcome the shortages in oil revenues. “We don’t want to see a reverse of our military victory due to our budget and fiscal problems, and we have been assured that every member of this coalition will stand with Iraq,” Abadi said. the Iraqi government didn't do much fighting before the prices dropped, so there's little to be lost.